Antibodies produced using PolyExpress™ have ELISA titers as high as polyclonal antibodies produced using a traditional protocol. 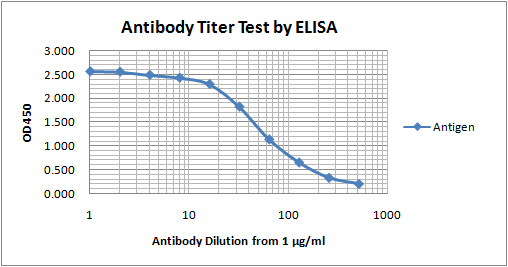 ELISA analysis of purified antibody generated by either PolyExpress™ protocol or traditional protocol. ELISA analysis of purified antibody generated by PolyExpress™ Antibody Service. PolyExpress™ generated an antibody with ELISA titer> 1: 256,000 which is higher than guaranteed.